Rich snippets and Organization of Schemas will be the most important factor determining factor in Google search in near future for your blog or business. It is quite obvious that, Larry Page like Harvard Scholar will love to see spam full web pages, copied news based blog on top 10 search result. Do Not Forget about Multi Agent System (MAS), it is unreachable to most copy paste website owners. Most common peoples, including employees of Google, refers as Update of Google’s Algorithm. They are actually adding exceptions, adding inclusions of various components of whole Multi Agent System. No one except two people knows the full working mechanism of your favorite word Google’s Algorithm. The reason is obvious – if any employee knows fully, he / she will sell to others or launch a new search engine company. That is the basic truth behind Coca Cola and all. Back to Rich Snippets and Organization of Schemas again. You can read about my Google Authorship Confirmation Email, it is actually as a part of their pilot project. We are saying about Dublin Core since many years. And for the easy way of rel=author implementation. Because in Google Scholar search, the data are actually arranged in that scientific way. 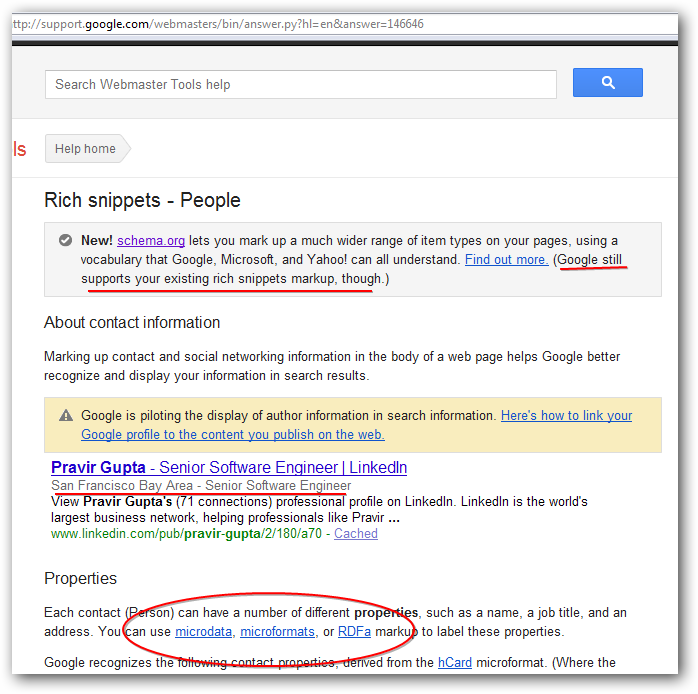 Another important article is Rich Snippets for WordPress. The role is actually limited. The usual backlinking to get higher SERP will actually overridden by who has written it. The role of SEO will be only on a point – implementation of the Rich Snippets and Organization of Schemas properly in the webpage, linking the profiles etc. In other words, a bit literate author can actually do it himself. The benefit is dual for Google – good verified content on Search Result plus more investment on Adwords, instead of hiring the SEO. There are basically three ways to implement these Rich Snippets and Organization of Schemas. We only need to know about microformat. This has bee probably adapted by Google due to the reason, it actually can be automated for the repeated entries and informations. In my case, if you use this website’s URL, my status will show as a green button saying Verified. Google currently officially supports rich snippets for people, events, reviews, products, recipes, and breadcrumb navigation. but people call me <span itemprop="nickname">Abhi</span>. for <span itemprop="affiliation">Goverment of India</span>. My name is Abhishek Ghosh, but people call me Abhi. Here is my homepage: thecustomizewindows.com. I live in Kolkata, IN and work as an Orthopedic Surgeon for Goverment of India. The problem and solution is in the WordPress Theme Framework. The div and span id should have to be updated. The real importance is – as I am really I am, these Rich Snippets and Organization of Schemas speaks about me like my fingerprint. Normally the Government, Edu, Academic websites give me access to link my Google Plus Profile page. A Hollywood star will get more importance when he will write about a movie, on the other hand, my associated writings will get more importance in Google Search. In other word – Rich Snippets and Organization of Schemas will help to give experts’ writing in Google top searches. This Article Has Been Shared 8809 Times! Cite this article as: Abhishek Ghosh, "Rich Snippets and Organization of Schemas : Detailed Article," in The Customize Windows, October 1, 2012, April 18, 2019, https://thecustomizewindows.com/2012/10/rich-snippets-and-organization-of-schemas-detailed-article/.